Pulping is the term used for the process which separates wood fibers. Chemical pulping, dissolving the lignin in the wood to create a pulp, is the most commonly used pulping process. Chemical pulping creates higher sheet strength than mechanical pulping; however, yields 40 to 50 percent pulp, where mechanical pulping yields 95 percent pulp. The two main types of chemical pulping are the more common sulfate pulping (most commonly known as Kraft pulping) and sulfite pulping. Kraft pulping accommodates a variety of tree species, recovers and reuses all pulping chemicals, and creates a paper with a higher sheet strength. Sulfite pulp, however, is easier to bleach, yields more bleached pulp, and is easier to refine for papermaking. The major difference between the two types of chemical pulping is the types of chemicals used to dissolve the lignin. The Kraft process was developed in Germany in 1879 and was first applied to a Swedish mill in 1885. The resulting paper was much stronger than any paper previously made, and therefore the process was named “Kraft”, (German and Swedish for “strength”). Kraft pulping creates dark brown paper which is used for boxes, paper bags, and wrapping paper. Kraft pulp can also be used for writing paper and paperboard when bleached, and for diapers when fluffed. The first step in pulping wood is to “cook” the wood chips. A digester, heated by steam, “cooks” the wood chips in white liquor (a mix of sodium hydroxide (NaOH) and sodium sulfide (Na2S)) until done. The cooking process dissolves most of the lignin and only some of the hemicellulose , leaving mostly cellulose to hold the fibers together. The digester system may be a batch or a continuous process. Relief gases are vented continuously from the digester, which helps remove air and other non- condensable gases and reduce the pressure at blow, when the pulp is discharged to the blow tank. After the cooking process, the pulp and black liquor (the chemical mix left after the cooking process) are discharged to a blow tank. By-products can be recovered from the digestion process. For example, turpentine distills with water out of the blow tank and the evaporators and is separated to be used. The resin acids and fatty acids dissolved from the wood form sodium soaps which are skimmed off the black liquor from storage tanks, evaporators, and black liquor oxidation tanks, and then acidified with sulfuric acid to form tall oil. 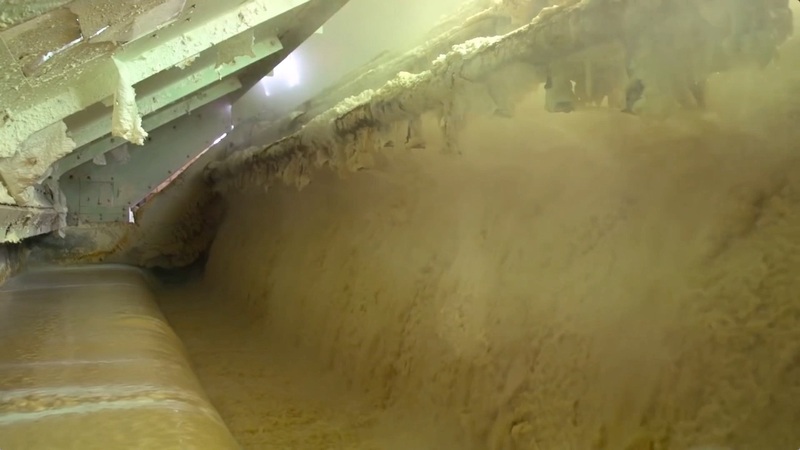 Before the washing process, the pulp is usually sent to deknotters, screens used to remove knots (large pieces of fiber not completely broken down in the digester). Pulp from the blow tank and deknotter is washed with water in a process commonly called brownstock washing. Washing removes weak black liquor from the pulp which is sent to the chemical recovery process. This also prevents contamination during subsequent processing steps. Types of washers used include rotary vacuum washer (most common type of washer), diffusion washers, rotary pressure washers, horizontal belt washers, wash press, and dilution/extraction. All the washer types use water (fresh or recycled) and are usually placed in series to achieve higher removal efficiency. The rinsed pulp is screened for oversize particles and then excess water is removed. This is done in a gravity thickener (more commonly known as a decker). The reason Kraft pulping is economically successful is that the used cooking liquor can be recovered and reused in the chemical recovery process. The first step in recovering the chemicals from the black liquor is evaporation. This removes excess water from the black liquor and maximizes the fuel value for the recovery furnace. There are two types of evaporators generally used in the chemical recovery process: direct (DCE) and indirect (NDCE) contact evaporators. Some types of DCE include the multiple-effect evaporator (most common), flash evaporation and thermocompressor evaporation. DCE use heat from direct contact with the recovery furnace flue gases, while NDCE uses indirect contact. Black liquor oxidation is needed after DCE, but not after NDCE. After DCE, the black liquor is normally oxidized with air to control the sulfide level and prevent the release of odorous compounds. This is done by countercurrently passing the black liquor through an air stream using a porous diffuser, sieve tray tower, packed tower or agitated air sparge. The oxidation reaction converts sodium sulfide to sodium thiosulfate. After NDCE or black liquor oxidation, the black liquor is then forced through spray nozzles into the recovery furnace, where it is burned providing heat to generate steam. This also conserves the inorganic chemicals, which create a molten smelt on the floor of the furnace. The molten smelt, composed of sodium sulfide and sodium carbonate, is drained from the recovery furnace hearth through smelt spouts. In a smelt dissolving tank, the smelt is quenched with water, producing green liquor. Sodium carbonate from the smelt is then converted to sodium hydroxide in the causticizer by adding calcium hydroxide. The calcium carbonate resulting from the reaction precipitates from the solution and is collected and sent to the lime kiln where it is converted to lime (calcium oxide). The calcium oxide is then slaked to produce calcium hydroxide for reuse in the causticizer.